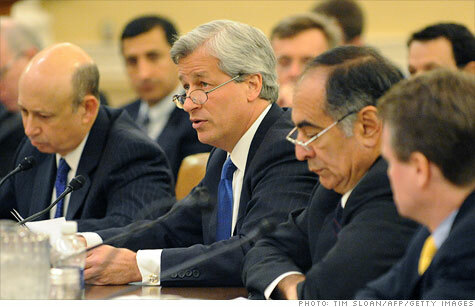 Bank CEOs testify on the effects of Dodd-Frank legislation. NEW YORK (CNNMoney) -- The latest rule aimed at limiting the types of bets that put the global financial system in peril in 2008 remains murky, at best. An early draft of the Volcker rule -- named after former Fed chief Paul Volcker -- was leaked on the American Bankers' website last week (Click here to read the leaked document). From the initial draft, how Congress and regulators will define those trades remains as confusing as when the law was initially introduced. "Our concern is that whatever the final rule is that it doesn't harm the markets' overall liquidity," said Rob Toomey, associate general counsel at trading industry group Securities Industry and Financial Markets Association. "The short answer is we don't know yet." The five main U.S. financial institutions affected by Dodd-Frank's Volcker rule-- Citigroup (C, Fortune 500), Bank of America (BAC, Fortune 500), Morgan Stanley (MS, Fortune 500), Goldman Sachs (GS, Fortune 500), and JPMorgan Chase (JPM, Fortune 500) -- have all already fulfilled the legislation's primary mandate by shuttering their standalone proprietary trading desks, or those that trade the banks' own capital. Proprietary desks provided a relatively consistent source of revenue during good times but they generated staggering losses for banks during the financial crisis. For example, the six largest U.S. banks generated a combined $15.6 billion in revenue from their prop desks between June 2006, and December 2010. During the height of the financial crisis, those same banks recorded $15.8 billion in losses in the span of five quarters, according to a July 2011 report by the U.S. General Accounting Office. "There aren't two people in the same room that agree on what proprietary trading is and how you define it," said Kevin Petrasic, a partner in Paul Hastings' global banking practice. "Regulators are trying to put meaning and certainty into a set of requirements that are broad and vague and that's the reason we're seeing a proposal like the one we have now." From the leaked draft rules, analysts and executives said that the most onerous part of the Volcker rule will be the expected mandate to record how every trade ultimately benefits a client. That could be both time consuming and expensive. "A lot of institutions will struggle with how to implement that compliance program and demonstrate that they're not engaged in proprietary trading," said Petrasic. "The stakes could be very high if you get it wrong." Among the questions that the draft rule does not answer: what type of risk hedging is permissible and what type of inventory can a bank build up on behalf of clients? For example, if a major bank expects significant trading in a stock or corner of the market, can it build up an inventory ahead of time by buying that stock so as not to move the market when it trades? Another looming question: can a bank take broader short positions in stocks to hedge its current clients if the Federal Reserve raises interest rates? The good news for banks: there's still time to fill in the details. "Regulators really do want guidance on how this will affect the banks," said Petrasic. Banks and other involved parties will have 60 days for comments once the rule is put before Congress. The Volcker rule also aims to limit banks' investment in private equity funds. The draft rule states that a bank can't allocate more than 3% of its overall assets to a private equity fund or provide more than 3% of a private equity funds' capital. This will affect Goldman Sachs more than its peers, since private equity investments make up a larger share of Goldman's overall revenues, according to Jeff Harte, a banking analyst with Sandler O'Neill. Banks are expected to have five years reduce their share of these investments. Private equity firms typically make investments over five to seven years so Goldman could whittle them down rather than sell them outright. Over time Harte estimates that exiting private equity investments might not hurt Goldman's earnings because the bank could use cash generated from exiting some of these investments to reinvest in other areas or buy back shares. Not a recession. But who cares?